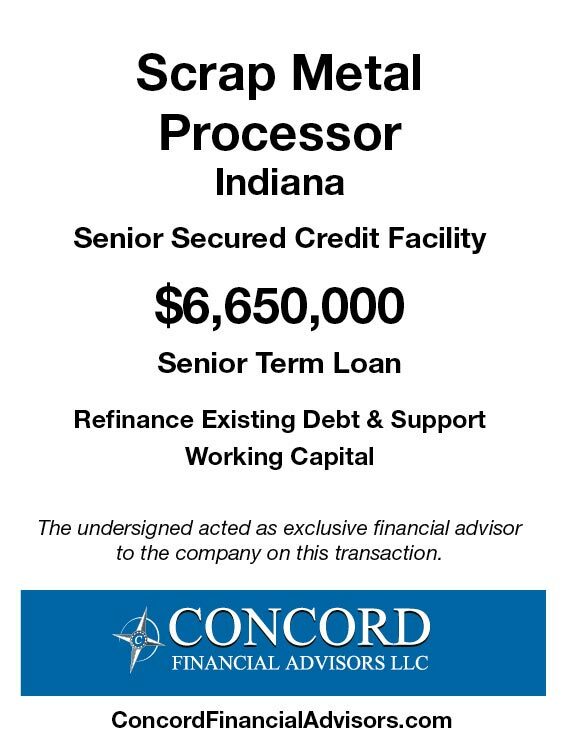 A Midwest scrap metal processor was seeking to refinance its existing senior credit facility and secure incremental working capital for growth. The company was under distress and required a balance sheet restructuring. The company retained Concord as its exclusive financial advisor to arrange a new senior facility with a non-bank lender under flexible terms. Concord identified a variety of non-bank lenders for the transaction and ultimately secured a cash flow term loan based on a multiple of the companies EBITDA. Concord also served as “arbitrator” between the company and the bank, resulting in a more favorable situation for all of the parties involved. The company was able to achieve its primary objective of exiting the bank, restructuring its balance sheet and obtaining incremental working capital.